The temperatures are cooling off quickly this fall. It looks like this will be my last chance to check in on the bees. 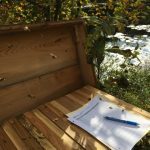 On the ninth of October, I headed out to Old Frog Pond Farm for the final inspections. For winter, I am adding a layer of wool on top of the bars along with the peppermint stems and essential oil to deter the mice. At a later point, I will put up some kind of wind break to protect the hives from the cold wind. 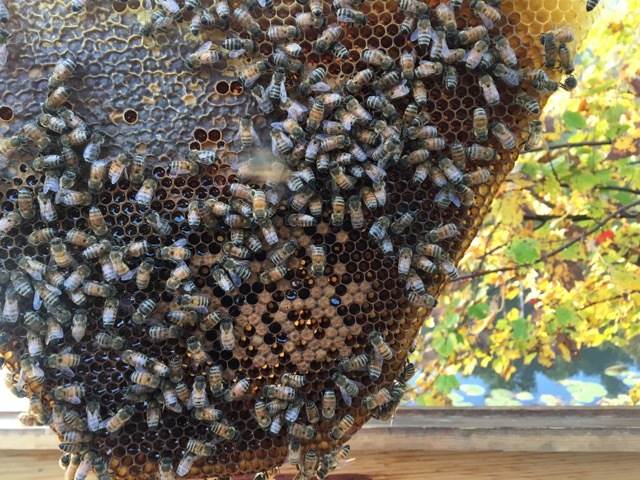 The Orchard Hive bees were busy foraging when I approached the hive. There was a good amount of activity around the entrance. The colony is still a good size. They have removed most of the drones at this point, there are still a few left. They will finish evicting them in the upcoming days as it gets colder. This colony is living on twenty two bars and they have fourteen bars with brood. 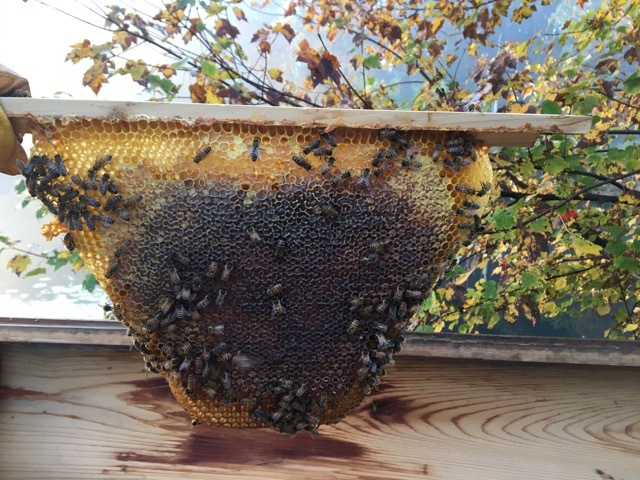 It is such a good feeling to see this colony so big at this time of the year. 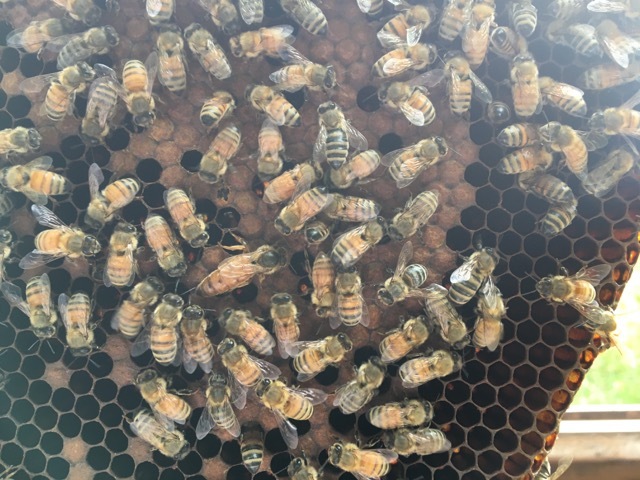 I was able to spot the queen and they were very easy to work with today. 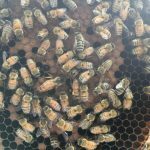 It’s so calming to work in a hive when the bees are comfortable with me being there. Today I took my time looking everything over carefully. Honey stores were the thing that was missing from this hive. 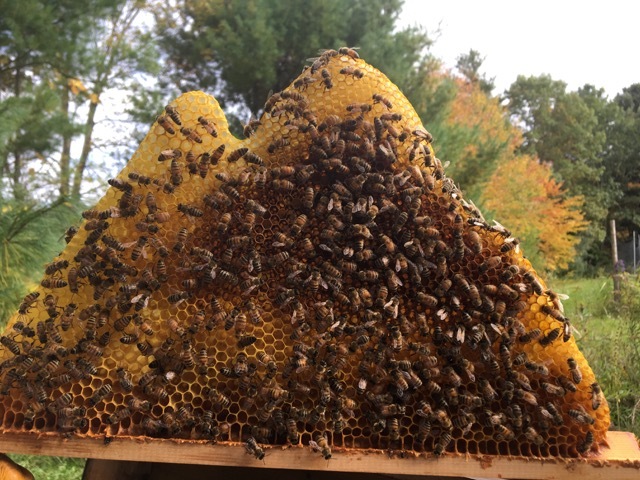 They have some capped honey, but only about one bar in total. They really need seven to ten bars to make it through the winter. As for nectar, they have approximately seven bars worth of it spread throughout the hive. What I found was just not enough to put my mind at ease. 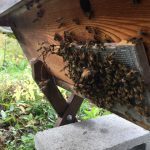 While it is still warm enough, I will put some solid food into the hive for winter. 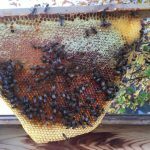 Once I finished inspecting them, I closed up the hive and put the wool on top of the bars. I added the peppermint stalks and some extra peppermint essential oil. The wool is just a felted piece that I folded and put over the bars. 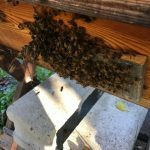 The thinking behind it is to add a small amount of heat retention to the hive. As long as the mice don’t find it! At the Willow Hive there was more activity than I thought there should have been at the entrance. It looked as if they were being robbed. 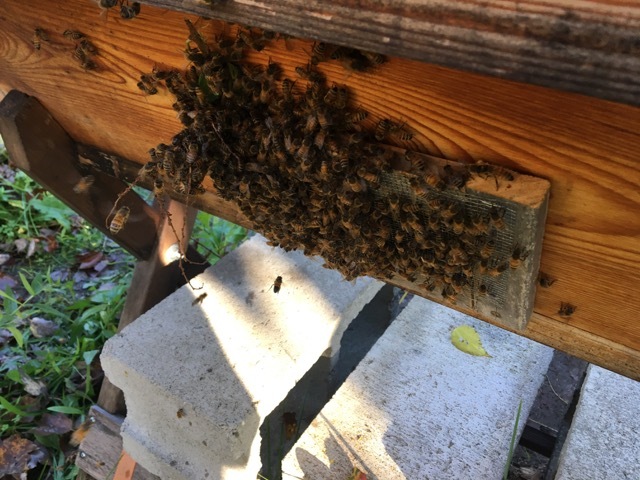 Just to be safe, I decided not to open the hive at that time and instead wait until the next morning. In the morning the temperature would be lower and there would be less chance of robbing at that time. I stayed and watched for a bit and I couldn’t determine if it was robbing or not. When there are robber bees there it looks frantic and chaotic, but this did not look that way. It was just really busy and congested. I still didn’t want to open the hive until the morning, just in case. 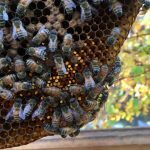 The next day I was back at the farm to inspect the Willow Hive. It was early enough that there wasn’t much activity at the entrance. 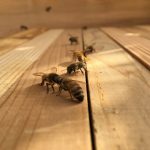 Upon opening the hive I discovered that they weren’t being robbed, they were just a really big colony! What a relief! The bees were a bit agitated today, but I understand why. It was cooler and the sun was just starting to warm things up for the day. The bees would have preferred it if I would have come back later in the day, but I didn’t want to take chances with robbing. 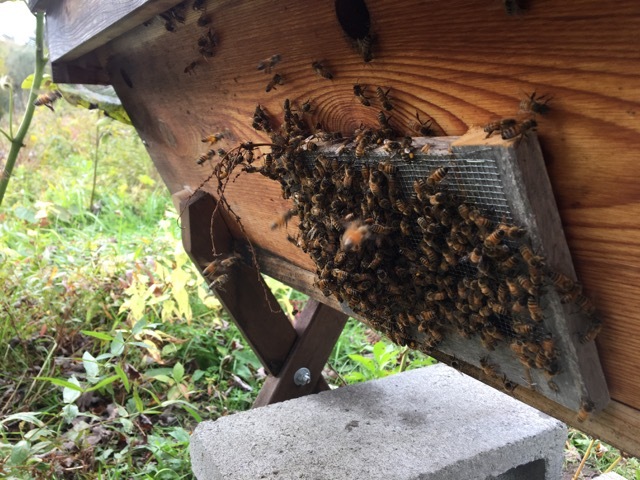 Having the hive open with bars out is like an invitation to a buffet for robber bees. 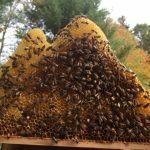 Feeding this hive definitely paid off. They have approximately fourteen bars of food combined over the seventeen bars they are living on! I am so excited for them! This means that I do not need to feed them solid food for the winter. It also meant that I could remove the feeder jars since they wouldn’t be taking in the syrup for much longer. 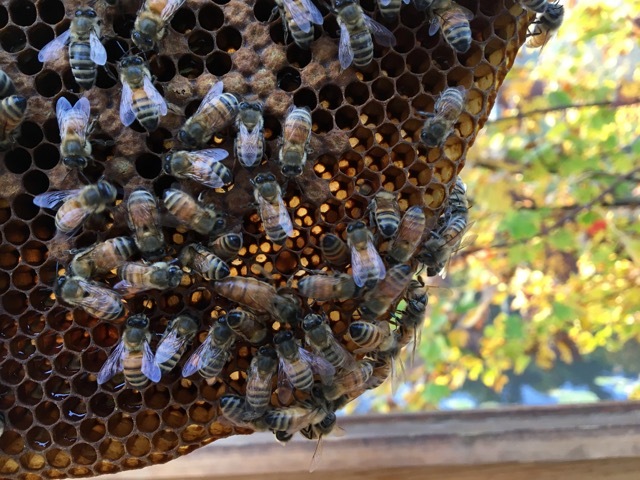 During the inspection, I found the queen and a small amount of brood. Unfortunately, I broke one of the combs that I had broken earlier in the season. I didn’t pull it all the way out and I just left everything in place so that I didn’t disturb them too much more. By this time, the bees were angry at me and wanted me out. Luckily, I was almost done. 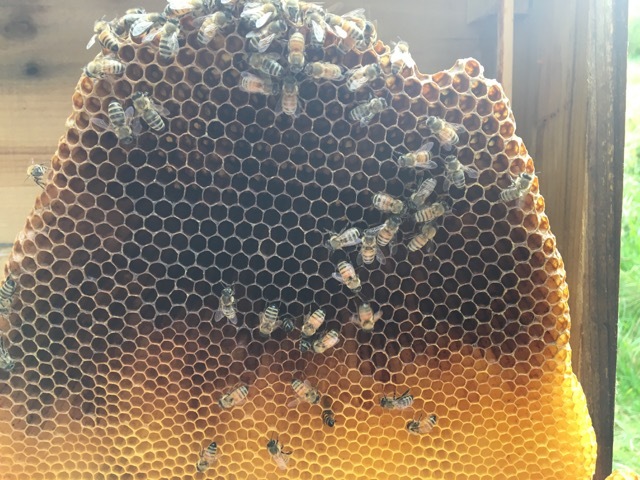 I looked at the last few bars and then closed the hive up. One of the bees crawled into the crease in my gloves and stung me on the wrist as I was closing everything up. Ouch! Before I could finish closing up the hive I had to put the bentonite clay onto my wrist. The bentonite clay has been a miracle worker for me this season. Bentonite clay draws out toxins when it is applied. I added some clay to a little bit of water to create a paste and then put the paste onto my wrist. This would help to reduce my reaction to the sting. Back at the hive I added the wool to the top of the bars. Then I put on the peppermint stalks and added some peppermint essential oil. This hive has had some issues with mice this year and last. 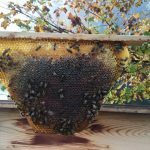 Last winter it was due to the hay bales that I put around the hive, I won’t be doing that again this year. Now let’s hope the mice take a hint and stay out. 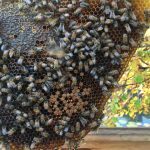 The Willow Hive looks good and I am feeling much better knowing that they have lots of food in there for the winter. 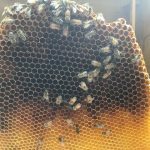 I am concerned about Orchard Hive though. 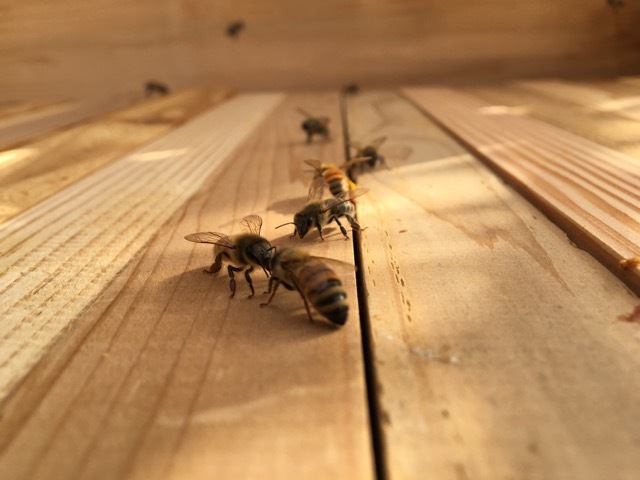 They don’t have enough food, so I will add solid food into the hive soon. My time will be limited with the temperatures dropping at the rate that they are. I am very glad to see that both colonies are still such a good size. In the past, my colonies have always been smaller going into winter. 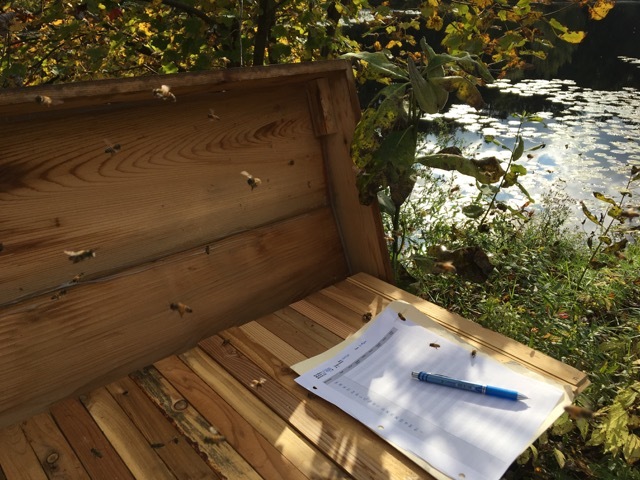 The last time I inspected the Meadow Hive will be the final inspection for that hive. 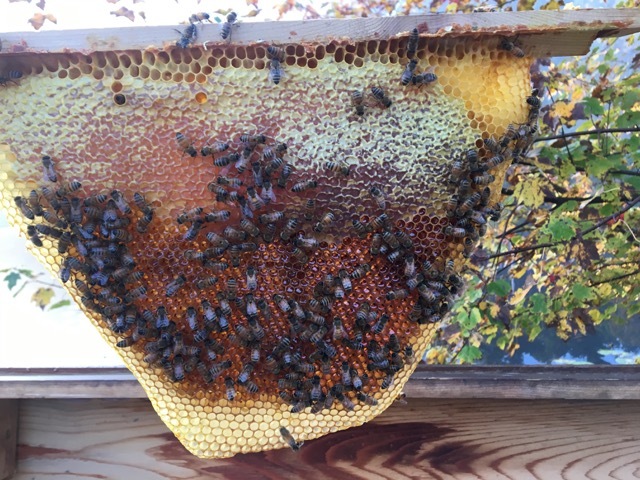 They are still a great size and the hive is full of honey. They don’t need me to intervene at all. If I want to see how they are, I can peek in the window. I am sure that they will appreciate me not disturbing them any more this year.